Katie got her grades for this semester at Normandale: 3 As, 3Bs. She is now the proud owner of an Associate's degree, and she will graduate with honors! Katie has also attended her LAST DAY OF SEMINARY! Four years of getting up to be at seminary by 6 a.m. (yes, she was frequently late) five days a week studying scriptures. She rarely missed a day, and there were some Spring Breaks when she could have not gone, but she went anyway. She served as Vice president over Music, counselor, and secretary in the seminary presidency. My baby is moving on. High school graduation is next, although that seems weird to have graduated from college (albeit a community college) before having completed high school. At the moment, Katie is working on a major project for her grad party. 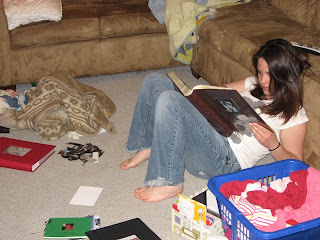 She is assembling many many photos into albums. She sounds like an amazing & lovely girl! You must be very proud....did you get a haircut, Sara?? Yes I did! See post titled "On the Chopping Block." I had about 8 inches cut off. Katie is amazing. It's really something to graduate from college BEFORE graduating from high school. I'm really proud of her. This college grad will certainly reduce the $$ outlay for the U of U. Happy Graduation from Normandale, Katie. What a way to whip through college. Happiness is flowing your way. Wowzers, Katie! It must be a very cool feeling to have that completed. Congrats! !